The JBIFC is very sad to report the death of actor Richard Kiel, aged 74, on September 10 in California. 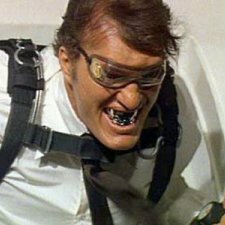 Richard played the very tall steel-toothed henchman ‘Jaws’ in two James Bond movies, The Spy Who Loved Me (1977) and Moonraker (1979), and also reprised the role in some 007 videogames. Sir Roger Moore, who tweeted his his response to the news, said he was ‘distraught’ to hear about his friend’s passing, especially as they had been on the same BBC radio programme (The Reunion) just a week earlier. Richard Kiel was born in Detroit, Michigan, and made his screen debut in 1960 in an episode of the TV series Laramie. In between acting jobs in the early 1960s, he took jobs as a bouncer, a cemetery plot salesman, and even as a maths tutor at night classes. But he persevered with his acting career, and continued to appear in various TV programmes in the 1960s, including an episode of The Man From UNCLE. His casting as ‘Jaws’ for Roger Moore’s third James Bond movie, however, brought the 7ft 2inch actor to worldwide fame (he was actually 7ft one-and-a-half inches, but he told people he was 7ft 2inches ‘because it was easier to remember’). Production on the movie started in 1976, and was Albert ‘Cubby’ Broccoli’s first film as solo producer. The producer was under considerable pressure to prove to the world that the Bond movies were alive and kicking, and Cubby was very keen to cast very memorable support roles for the main actors. One key role was ‘Jaws’, the enforcer and main assassin for Karl Stromberg, the main villain. The other henchman was Sandor, who would work alongside ‘Jaws’. Sandor was played by Milton Reid, a tough-looking former wrestler who had previously had a small role as a guard in Dr. No. The story is that an assistant had seen Richard Kiel in an episode of the American TV series The Barbary Coast and suggested him for the role of ‘Jaws’. Realising how popular the role of Jaws was with test audiences for the movie, and sensing that the movie was becoming very special indeed (it remains Sir Roger’s Moore’s favourite 007 movie to this day), the Bond producer ‘Cubby’ Broccoli decided that, instead of dying in an inferno or being killed by a shark, Jaws should be seen swimming away in the final scenes of the movie. Sir Roger Moore, looking back on The Spy Who Loved Me in his 2008 memoirs My Word Is My Bond, recalled of Richard Kiel and his role as Jaws: ‘I can’t think of two more different characters – Richard is so kind, so gentle and indeed an accomplished writer as well as an actor, whereas Jaws is, well, a hired killer without much soul. Jaws did have a dry sense of humour, thanks to the little nuances Richard gave him’. Richard published his memoirs in 2002, entitled Making It Big in the Movies, and he loved chatting to fans at film conventions and fairs around the world. So sad to hear about Richard Kiel: he was brilliant in both of his Bond films, just a pity he wasn’t in another one. RIP big man. Well, I remember him as a villain under Dr Loveless in The Wild Wild West. He played mostly villains in other movies, but he did change sides in Clint Eastwood’s Pale Rider, like he did in Moonraker. RIP.